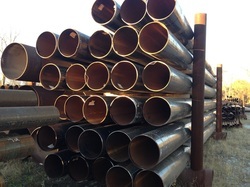 Centrally located in Alton, Illinois, Eagle Tubular Products has been a leading distributor of carbon steel pipe and structural tubular products since opening our doors in 1998. We also manufacture the highest quality sign support structures, billboard structures, bollards & machinery guards, and athletic field shelters, pavilions, scoreboard structures and more!! We cater to a very diverse range of industries, including construction (casing, piling, bollards), sign & outdoor advertising, steel fabrication, steel service centers, water works supply companies, OEM, school & park departments, just to name a few. We are committed to providing quality products and on time deliveries at competitive prices. This is the formula that, through the years, has allowed us to build and maintain a very loyal customer base and hopefully the formula that will allow us to EARN YOUR BUSINESS! Please browse through our website and contact us by phone at (888) 558.1702 or e-mail us at sales@eagletubular.com. ​sign pole and support structures since the company began in 1998! Our knowledgable sales staff has over 100 years of combined experience in the design assistance and sales of sign structures. All welders are AWS certified and we have a CWI on staff! 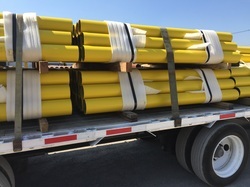 At Eagle Tubular Products, we offer a wide variety of bollard products from stationary "embedded" or "plate mounted" bollards to lockable, removable bollard systems, along with custom bollard and barrier solutions. All bollards can be coated to you specifications. Our inventory of over 6000 tons, ranges in size from 2"-48" diameter in walls up to 2" in thickness.Larger OD's made to order. Grades: A500, A252, A53, A106, API5L through X70. Most of our A500, A53 and A252 items are melted and manufactured in the USA. We also carry structural and limited service items. We have the inventory and service capabilities to help get your project completed on time and in budget. 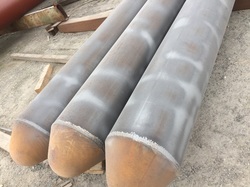 Cut to length or weld to length. End plates, conical points, drive shoes, cutting teeth all attached by AWS certified welders. We can build your billboard or scoreboard support structure with the engineering that you provide, or we can assist with the design process and have the structure engineered for you. On time, job site delivery is available throughout North America and the Carribean!